Dec. 12, 2017 10:50 a.m.
A pair of Victorian gentlemen will take to the streets of Langley this week to remind local businesses of the spirit of giving. 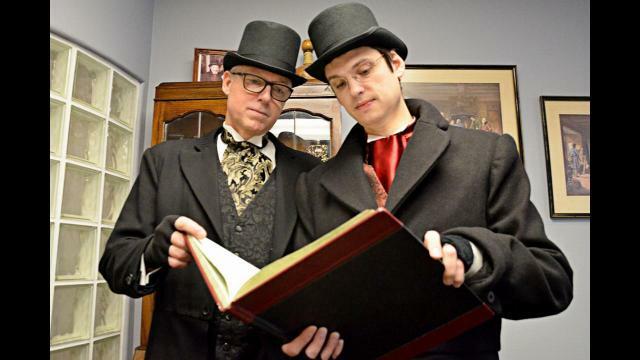 Wayne Kuyer and Kyle Murray of Kuyer & Associates Accountants will don top hats and waistcoats to portray Jacob Marley and Bob Cratchit. In Charles Dickens’ A Christmas Carol, Jacob Marley’s ghost is weighed down with chains forged from a life of selfishness and greed. But Kuyer has been playing the role Marley for 22 years to help the less fortunate, collecting funds for the Langley Christmas Bureau and the Province Empty Stocking Fund. He began the fundraiser in 1996 with his late partner Stephen de Verteuil, who portrayed Ebeneezer Scrooge. “We were tossing around some things we could do at this time of year to make a difference,” Kuyer remembered. He’d always loved A Christmas Carol, and de Verteuil had an appreciation for the Victorian era. Scrooge and Marley’s counting house also seemed to fit with their work as accountants. The duo, dressed as two of literature’s most famous misers, began arriving at local businesses to solicit donations. De Verteuil passed away in 2002 at the age of 47, but Kuyer has kept the fundraiser going. This year he’s got a new accomplice, with his colleague Murray taking on the role of put-upon clerk Bob Cratchit. Since Murray is the new arrival at Kuyer & Associates, he seemed like a good fit for the role. “I’ve seen the fundraiser from a distance for many years,” he said. The duo will arrive with Marley tossing around a few “Bah! Humbugs!” and asking to see the proprietor. They’re popular figures in local businesses, mainly arriving now by appointment. Murray jokes that his boss is always in character as Marley. “I remind him from time to time that Christmas is just an excuse to pick a man’s pocket,” Kuyer said. The fundraiser runs from Dec. 12 to 18th. Since 1996, it has raised more than $249,000 for B.C. charities.